the trend follower: Developing your level of competence - which step are you on? 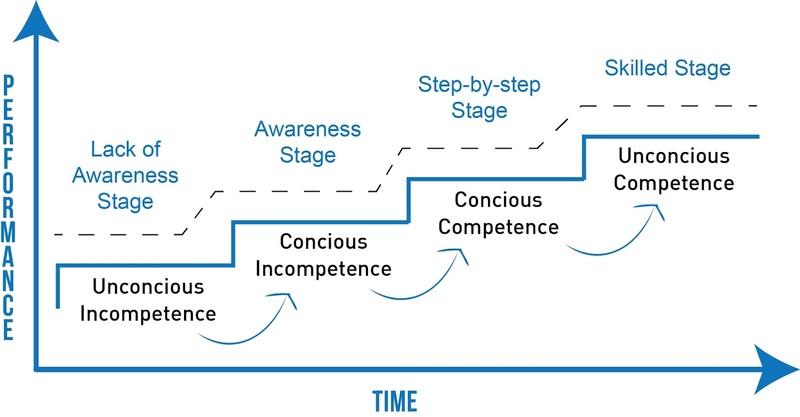 Developing your level of competence - which step are you on? In trading, as in any walk of life, it takes plenty of experience to evolve from being unconsciously incompetent to unconsciously competent in what you are doing. After you start to build up your bank of experience through repetition of those basic actions as well as your interaction with these other elements (which you cannot control), all these elements start to become second nature. You learn how carry out those physical actions without thinking, as well as observing and reacting to an ever changing environment without delay. Now lets take those principles and look at one element of the trading process - identifying a potential setup. When I go and meet traders who want to learn what I do, after going through some examples and explaining in detail the characteristics that I look for, I often run a scan of stocks and go through the charts at my normal speed. More often than not, they are astounded at the speed I can do this, but that is because I have looked for the same setups day after day, week after week, year after year. Its become second nature to me. One of the reasons I for this is because I cut out all the 'fluff' or noise from my selection and trading process - partly because my scans have done a chunk of the work for me, but also because I have honed my skills in identifying something that meets my criteria. In other words, all I am left with is the information I believe I need to make an informed decision. I don't care whether it meets someone else's criteria, whether it is a 'hot' stock, whether Cramer has been talking about it - all I care about is whether it meets my criteria. And when that happens, I know what to do and follow through on that. Of course, over time with experience of market situations these skills have also been developed and simplified when it comes to other aspects of my trading process - not only in terms of developing my rules, but also in my ability to observe what is happening both in the market and my positions (which you can't control), and from there to act in accordance with those rules without question or hesitation. Occasionally in sport you sometimes hear commentators talking about someone who has missed what looked like an easy shot, saying they had "too much time to think". Yet a few minutes later, the same person may have made a much more difficult shot, because "they didn't have time to think" - they just reacted to the situation. That's the type of mindset I strive for - and so should you. See it, acknowledge it, and act on it as required, without thinking or delay. That's unconscious competence.